It’s the time of year when even the tee-totalers among us are tempted to imbibe in a little tipple. Just a little something to celebrate the season, don’t you know? And why not? As long as you use moderation, I say go right ahead and enjoy all those traditional Christmas season drinks – mulled wine, warm cider and, of course, eggnog! Rich, creamy, spiced eggnog. Yum. It has always been a favorite. My mama makes a delicious eggnog, rich with cream and egg yolks and spiced just right with cinnamon and nutmeg. It’s always a perfect option for a Christmas get-together. So, loving eggnog as I do, I’m always looking for new ways to serve it. Today I’m sharing one of my favorites with you. This delicious Mocha Eggnog Sundae is a combination of eggs, cream, and spices, with bourbon, chocolate, and coffee. This is a real winner! I remember when BeeBop and I taste-tested it for the first time, we both looked at each other and said “Wow!” Literally. I’m telling you, I enjoyed every single drop of this and when my glass was empty, I have to confess that I ran my finger around the inside and got the last little taste. It’s that good. Using a small, sharp knife, split a vanilla bean and scrape the seeds from the inside. 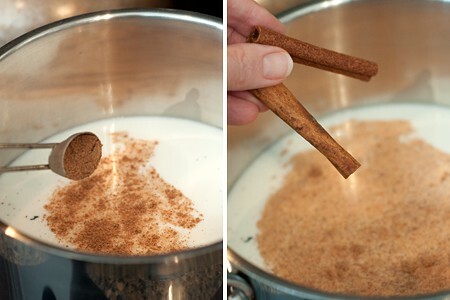 Add the vanilla bean, seeds, milk, half and half, cinnamon sticks, and nutmeg to a medium saucepan. Place the mixture over low heat and bring barely to a boil, stirring frequently. Meanwhile, beat the egg yolks and 3/4 cup sugar in a medium bowl until they’re pale yellow in color and fluffy. By the way – don’t toss those egg whites! You can freeze them and use them for another recipe. 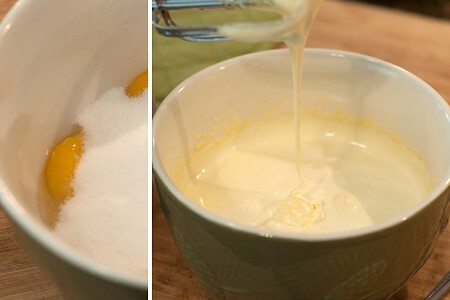 Gradually add 1 cup of the hot milk mixture to the beaten egg yolks, beating with a wire whisk until well blended. 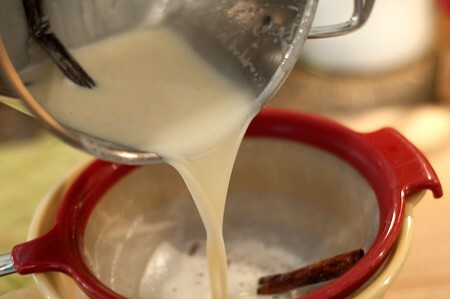 Gradually whisk the milk and egg yolk mixture back into the remaining hot milk mixture in the saucepan. Cook and stir on medium-low heat for 3-5 minutes or until the mixture thickens and coats the back of a spoon. Strain the mixture into a large bowl and allow it to cool slightly. Cover and refrigerate overnight or until thoroughly chilled. 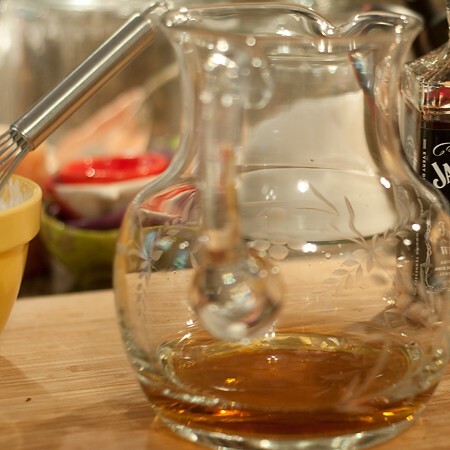 When ready to serve, add the bourbon or rum to a serving pitcher. Stir in the chilled eggnog. Whip the cream and remaining 1/4 cup sugar until soft peaks form. 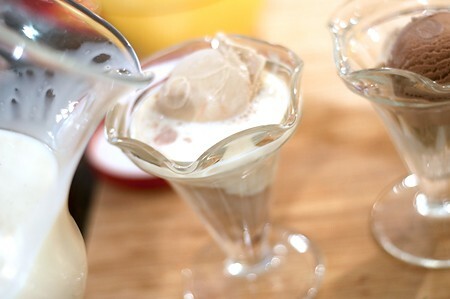 In a bowl or tall glass, place one scoop of coffee ice cream and one scoop of chocolate ice cream. Pour over the chilled eggnog. Top with whipped cream and crushed peppermint. Garnish with a peppermint stick if desired. Coffee and chocolate ice cream with eggnog! 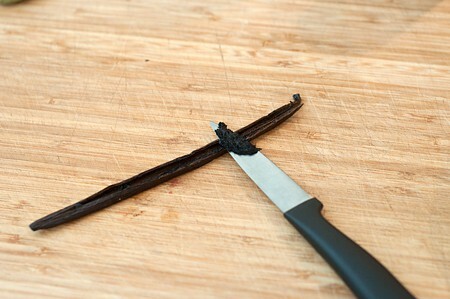 Use a small, sharp knife to split the vanilla bean and scrape the seeds from the inside. Add the bean, seeds, milk, Half and Half, cinnamon sticks, and nutmeg to a medium saucepan. Place the mixture over low heat and bring barely to a boil, stirring frequently. Meanwhile, beat the egg yolks and 3/4 cup sugar in a medium bowl until pale yellow in color and fluffy. Gradually add 1 cup of the hot milk mixture the beaten egg yolks, beating with a wire whisk until well blended. 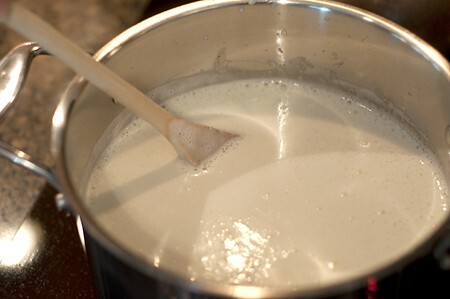 Gradually whisk the milk and egg yolk mixture back into the remaining hot milk mixture in the saucepan. Strain the mixture into a large bowl. Allow to cool slightly. Cover and refrigerate overnight or until well chilled. 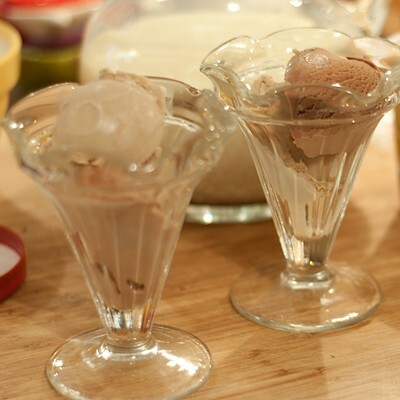 In a bowl or tall glass, place one scoop each of coffee and chocolate ice cream. Pour over the chilled eggnog. 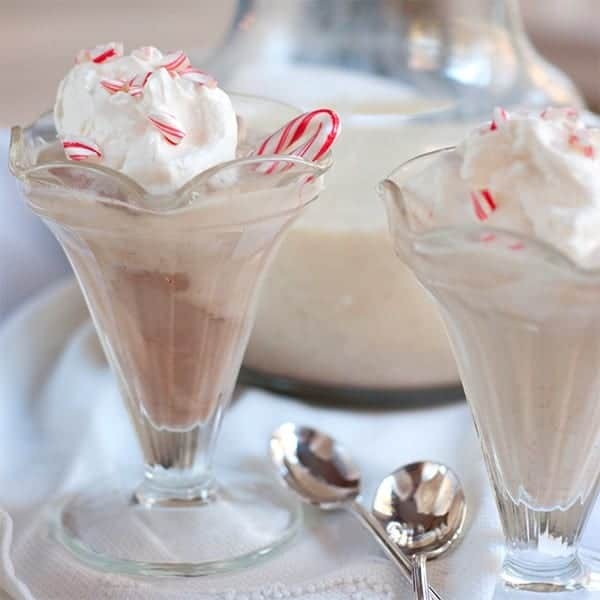 Top with whipped cream and crushed peppermint. Garnish with a peppermint stick if desired. Thanks, Renee! If I do say so, it really is amazing. Oh my gosh…you know this is calling my name, right? This would take the tee out of any totaller! I was really hoping you’d give your stamp of approval to this one, Barb! It’s so delicious. My mom and brother will love these!! I hope you’ll try it, too, Angie! Thanks, Marie. I am really pleased with this recipe. That’s about the best looking thing I have seen all day! You’ve gotta trying this! You won’t believe how good it is! 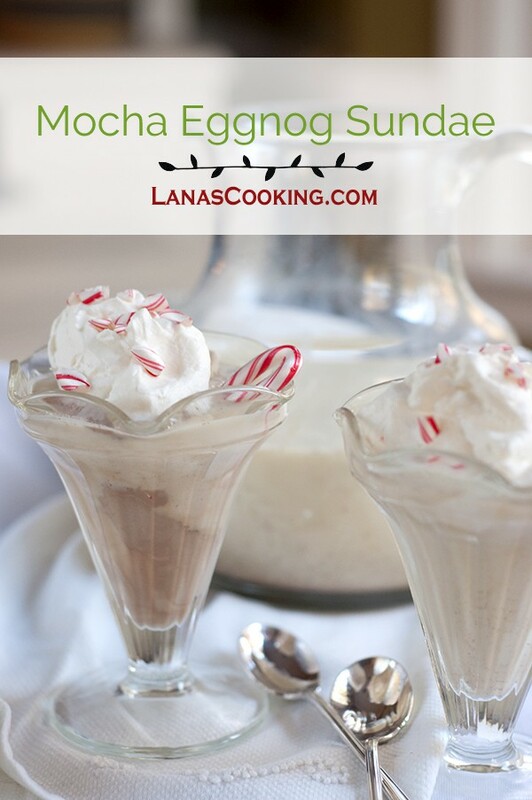 I love home made Eggnog and this is one decadent recipe Lana! Decadent is a perfect description for this! It’s rich from the eggnog plus the coffee and chocolate ice creams just put it right over the top. Yum!! What a fun treat!